Read this somewhere recently and it gave me pause. And like the sun spilling its light at dawn, which, like flood waters in slow motion fills every dark corner of the world, realisation rushed over me that it rings so true. At least with me. Pathos in my life is not a tragic monolith blocking out the light. Rather it is a darkly liquid, deep, deep well upon which I gaze and see the true face of the world and its ways. But ever so often, it revels a reflection of my own soul. Melancholy is internal and perhaps essential to experience the complex nuances of poetry, which again is deeply personal. Even the happy have a little cupboard in the corner where they store their sadness. I seek joy like any other yet it is sadness that makes me sigh at cruel irony, endure pain and respect the invincibility of life every time it knocks me down, be grateful for happiness and yes, seek poetry and find it to be ever so much sweeter. Mellow was the mood and therefore the food. Slowly braised, while I leisurely sampled a book of verses from a friend whose soul resonated with mine. With layered flavours, some bold, and some shy, this chicken casserole is something that you can cook a potful of and enjoy over a few days as its flavours deepen. I see myself eating it with my family on winter evenings, or with a friend watching a chick flick, or on a Sunday afternoon when I’m too lazy to cook. The recipe can easily be doubled to serve at a large party with fresh crusty bread and a green salad. A good red wine is essential as is a robust red pesto that you can make ahead of time. The pesto could use sundried tomatoes or roasted red peppers as its base; each would produce somewhat different flavours but both will work equally well with red wine and sweet, red grapes. To make the pesto, blitz all the ingredients with a steady stream of extra-virgin olive oil to make a smooth and creamy pesto. Store in a clean glass jar in the fridge for upto a week. Heat 2 tablespoons of olive oil in a deep casserole dish or Dutch oven. Put in the chicken thighs and sear to brown on both sides for about 3-4 minutes. Set aside. Heat the remaining olive oil on medium heat and sauté the onions. When the onions are translucent, add the garlic and cook for a further 30 seconds followed by the pesto. Cook for 3 minutes, then pour in the red wine and the water. Bring up to a boil and put in the chicken. Season with salt, reduce to a simmer, cover and cook for 20-25 minutes on slow till the chicken is cooked through and the sauce is reduced. 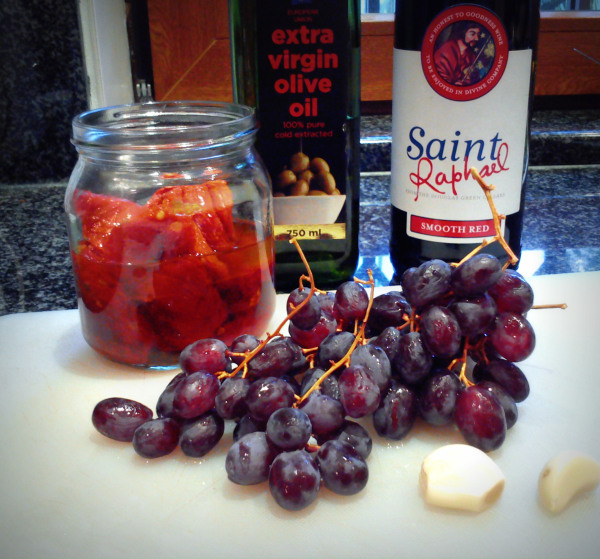 Toss in the red grapes, add the pepper, cook for a minute and serve. Alternatively, cool, replace the lid and refrigerate till needed.